Scores must be Submitted by: Friday, December 7, 2018	and within 14 days of being shot. This competition seems to have begun in the Netherlands in the 1400`s. There is a period illustration showing part of a circular target where there are numerical values in arcs of the circle. And there is mention of square targets with a series of smaller squares of different values. The target face is 20 inches on a side and the small squares are 4 inches square. 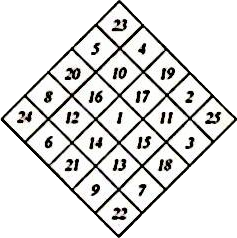 There are twenty-five squares in total. The target is placed with one corner pointing upward, as per the drawing below. The numbers are placed as shown in the drawing and should be large enough to be read at twenty yards. The lines should also be visible but no wider than 1/4 inch. A printable pdf has been kindly provided by Lord Cameron de Grey of Atlantia. The Adult distance is 20 yards. Youth division is 10 yards. The number of ends is two, each of six arrows. The scoring is value of the square hit. Lines count as the square with the highest number. A square may only be hit once for score. Repeated hits to the same square by the same archer to do not count for additional score in the end being shot. The archer may hit any or all of the same numbers in next end for score. The maximum score per end is 135, for a maximum total of 270 points. The score sheets should provide space for each Arrow's score (1-6) in each End (A, B) in a vertical column for ease in totaling. There should be a total for each end and a grand total. Please record the scores for each End starting with the highest scoring arrow to the lowest, with zeros entered for repeats or misses for any remaining arrows. A Scoresheet (PDF) is provided courtesy of HL Iurii Levchenich of An Tir.